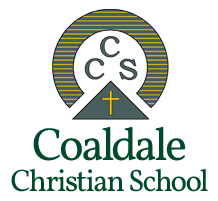 The Board of Coaldale Christian School invites applications for Science and Language Arts at the High School Level for the 2019/2020 school year. Coaldale Christian School offers Kindergarten to Grade 12 education and currently has a student body of approximately 200. We anticipate continued growth over the next several years. Coaldale Christian School is located in Southern Alberta offering small town living in a vibrant community of believers along with access to city amenities, a top notch university and the Rocky Mountains. Covenant Canadian Reformed School (CCRS) is a vibrant K-12 school community with a current student population of around 250. We are situated 3 km east of the hamlet of Neerlandia and approximately 25 km north of the Town of Barrhead. Between these two locations there are three Canadian Reformed congregations and one United Reformed congregation. CCRS is located about an hour and a half north of the cities of Edmonton and St. Albert. We anticipate growth over the next number of years and are currently planning for future expansion. We encourage energetic, qualified (or soon to be qualified) educators, committed to Reformed Christian education, to apply. Under our Father’s blessing of a broad, highly supportive membership base and current levels of government funding in Alberta, we are able to offer a very attractive wage and benefits package. 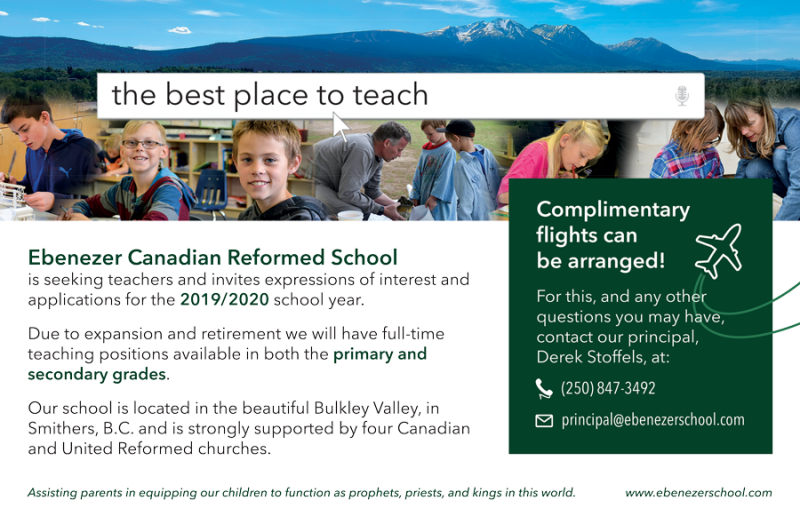 We would love to arrange flights for applicants who are out of province to come and visit our community! All interested individuals can apply by submitting a resume, a statement of faith, a philosophy of education, and references. We would love to arrange flights for applicants who are out of province to come and visit our community for an interview! The Credo Christian Elementary School Board invites teacher applications for a vacancy in our primary grades, beginning in September, 2019. CCES is a vibrant and inclusive K-7 school with approximately 220 students . Staff members enjoy the positive teaching and learning culture here, and are grateful for strong levels of community support. Duties to commence in September 2019. British Columbia affords teaching opportunities to those with Professional Certificates (B.Ed. ), Subject Restricted Certificates (undergraduate degrees), and School and Subject Restricted Certificates in the areas of applied skills (Diploma or Red Seal designation). Credo Christian High School is located in Langley, BC and has an enrolment of about 300 students in grades 8 through 12. It serves the educational needs of families from across the Fraser Valley through a broad range of programs, including music, visual arts, shop, textiles, athletics, and student leadership. Applicants are encouraged to apply for all or some of the positions. Duties to commence August 2019. William of Orange Christian School is an elementary school with a K-7 enrollment of 63 students. Located in the beautiful Fraser Valley, the school offers a supportive school community with many volunteers. Applicant must be a confessing member of a Canadian Reformed, United Reformed, or sister church. DCS is a K-12 Reformed school with over 230 students and an anticipated increase in enrollment of 20% over the next few years. It is located 45 minutes southwest of Winnipeg, Manitoba and offers a highly supportive community, attractive facilities, competitive wages and a friendly atmosphere. Applicants must be communicant members of a Canadian Reformed Church or a Church in ecclesiastical fellowship (URCNA, OPC, RCUS, FRCA, etc. ), willing to obtain a Manitoba Professional Teacher’s Certificate and be committed to the school’s mission statement. with duties commencing on August 1, 2019. Not your level or subject area? No problem! Teaching arrangements can be adapted to fit you. We would love to bring you to Winnipeg to discover our beautiful community and city. Immanuel Christian is a K-12 school supported by members of Canadian Reformed and United Reformed churches. At present we have 236 students in single grade classes. Teachers are supported by an extensive resource program as well as educational assistants for students with special needs. We have been blessed with a dedicated school society, as well as a cohesive and enthusiastic staff. We look forward to our third year of operation under the LORD’s blessing, anticipating an enrollment of approximately 125 students in our recently renovated school building. We are looking for qualified applicants who are committed to the Reformed faith and are passionate about educating God’s covenant children. Applicants should be members of the Canadian Reformed Churches or of a church with which we have ecclesiastical fellowship. Please submit a letter of application along with a resume, a statement of faith, your view of Reformed education and two letters of reference. If you have an interest in this position and would like to discuss it further, please do not hesitate to call or email us for further information. You can contact our principal, Mr. Ken Bergsma, at (289) 442-8825 or kbergsma@bellstoneschool.ca. at the Primary and Junior levels. The successful applicant will begin teaching in the 2019/2020 school year. Applicants must be a communicant member in good standing of a Canadian/American Reformed Church or any church with whom we have sister church relations or ecclesiastical fellowship. The successful applicants will begin teaching in the 2019/2020 school year. Applicants must be a communicant member in good standing of a Canadian/American Reformed Church or any church with whom we have sister church relations or ecclesiastical fellowship. If you are able and would like to help in educating covenant children at DACS, please send your letter of application and resume to the principal, Mr. Jelko Oosterhof (519-941-4368 or principal@dacslaurel.ca) or Mr. J. Grant Kottelenberg, Board Chairman (519-928-9801 or j.grant.kott@gmail.com). for the 2019/20 school year and beyond. Emmanuel has a student body of 178 students in grades 9 through 12. We are enjoying a wonderful, brand new, facility since September 2016, located in a picturesque southern Ontario town. Our school has excellent working relationships with board, staff, principal and society. Qualified individuals who seek to serve in the field of Reformed Education, and who submit themselves to Scripture as summarized in the Reformed Confessions, are heartily encouraged to submit an application, including a philosophy of education and references. Serving the Burlington/Flamborough area, we are home to ~170 students from JK-8 and are supported by robust and active church communities. Invites applications for full-time and part-time teachers. We are in particular need for teachers in the areas of science, math, geography, and history. We are also seeking a full time shop teacher. Applicants must be members of the Canadian Reformed or United Reformed Churches. All positions would commence August 1, 2019. For further information, please contact the principal, Mr. J. Heemskerk at school. Letters of application should include university and teaching qualifications, two letters of reference, a statement about your view of Christian education, and a recommendation from your church council or consistory. HOPE REFORMED CHRISTIAN SCHOOL provides Christian education at the elementary and secondary levels near St. George, Ontario. 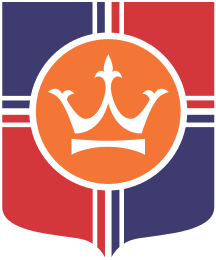 Together with the covenant community of church and home, we are committed to providing a Christ-centered, Reformed education to children from Kindergarten through to Grade 12 that will nurture and develop their God given gifts, character and Biblical faith for His glory and God’s kingdom. We are looking for qualified applicants who seek to serve Jesus Christ in the area of Christian education, and who submit to Biblical truth as summarized in the Ecumenical Creeds and the Reformed Confessions. Please submit a resume with a statement of your philosophy of education, a statement of faith, and references, including one from your current pastor. The Board of the Canadian Reformed School Society, Hamilton, Ontario operating the Timothy Christian School invites applications from qualified teachers to fill full time teaching position in the intermediate grades for the 2019-2020 school year. Duties to commence August 1, 2019.
Letters of application should include a resume, a statement of faith, your view of Reformed education and two letters of references. Our school has approximately 120 students in grades 1-12, thirteen full or part time teachers, excellent staff relations, a beautiful and functional facility, and a high level of community support. The Lynden area is an idyllic one, with access to a virtual cornucopia of outdoor leisure and recreation activities, and yet is within ninety minutes drive of the major urban centers of Vancouver, British Columbia, and Seattle, Washington.